1. Sprinkle chicken with salt and pepper. 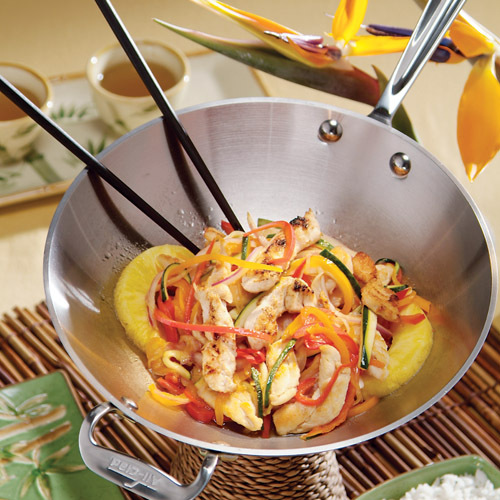 In large nonstick skillet or wok, heat 2 tablespoons oil over medium-high heat. Add garlic and ginger, and cook 1 minute, stirring constantly. Add chicken and cook 3 minutes or until lightly browned, stirring occasionally. With slotted spoon, transfer chicken to medium bowl. 2. Into same skillet, add bell peppers, onion, zucchini and remaining 1 tablespoon oil, and cook 3 to 4 minutes or just until vegetables are tender-crisp. 3. In small bowl, whisk together wine and brown sugar until brown sugar dissolves. Add wine mixture and chicken to skillet and cook 2 minutes. Add pineapple and cook 3 minutes or until chicken loses its pink color throughout and reaches an internal temperature of 165°; serve with rice. To easily grate ginger, peel and freeze ginger before grating.